CHICAGO (AP) For all the big shots he hit, Devin Booker was most proud of the one he blocked. ”That’s crunch time, so whatever I had to do to win,” he said. ”We hung in there when our shots were not going down (in the first half). We talked about making them call the first timeout. I’m sick and tired of calling the first timeout in quarters and they come out with a 7-0 run to take control and put it up to a double-digit game. Then in the fourth quarter, they get off to a 14-2 start. It’s just so hard to continue to climb uphill, especially late in the game like that.” – Bulls coach Fred Hoiberg. 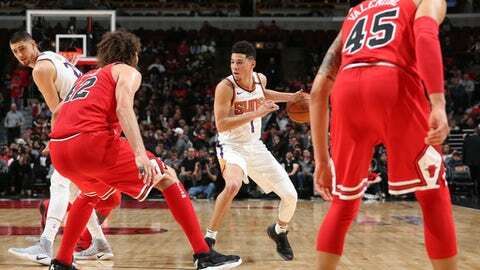 Suns: The Suns swept the Bulls for the first time since the 2007-08 season. … Booker has eight 30-point games this season. Bulls: F Nikola Mirotic attended a game for the first time since a preseason altercation with teammate Bobby Portis left him with several broken bones in his face as well as a concussion. He remains sidelined with the injuries from the altercation at practice on Oct. 17. Hoiberg said the two have not talked as far as he knows. Mirotic started practicing with the team again on Monday, and they did go against each other at times. … Mirotic and F Zach LaVine (torn ACL) will practice with the G League’s Windy City Bulls while Chicago heads to Denver for a game on Thursday. Suns: Visit Detroit on Wednesday. Bulls: Visit Denver on Thursday.